Will Analytics Save the Gap? Not Without a Strategy Reboot! Khadeeja Safdar reported in the Wall Street Journal this week about CEO Art Peck's efforts to turn around apparel retailer The Gap. According to the article, "The Gap Inc.'s market value has shrunk to about $10 billion, from roughly $40 billion at its 2000 peak. Revenue has stalled at about $16 billion—flat from a decade ago." The Gap owns several retail chains (including Banana Republic, Gap, and Old Navy). The article points out that, "The 61-year-old CEO is blunt in his criticism of the industry’s long fascination with creative executives who are given broad powers to set the overall image of a brand. 'We have cycled through so many, and each has been proclaimed as the next savior,' he said. In the end, they were 'false messiahs.'" Peck favors combining science with art. He hopes analytics can help drive better merchandising decisions, rather than relying on the intuition and foresight of powerful creative directors for each brand. I would argue that no amount of focus on analytics can save The Gap, particularly its namesake brand. The company has a strategy problem first and foremost. That problem has to do with the competitive positioning of the three brands. Each major brand does not have a distinctive competitive positioning. Moreover, the Gap brand is clearly stuck in the middle, trapped with an ambiguous strategy somewhere between the low cost position at Old Navy and the differentiated position at Banana Republic. That problem has existed for more than a decade. Until the company solves that problem, no amount of reforms in its merchandising process can save this once-iconic brand. Moreover, as the article notes, the Gap has failed to adapt to the fast fashion strategies of competitors such as Zara. The Spanish retailer has developed a completely different strategic positioning and unique value chain. Copying one or two elements of Zara's strategy will not suffice. Zara is successful because of the entire system of activities and choices that they have made. The Gap has made a vastly different set of choices, and they have undertaken quite different activities. Adapting the Gap's value chain to fit the new competitive environment will be very difficult. Does Variety Make Us Happier? We have all heard the expression, "Variety is the spice of life." Is it true? Do we value variety highly? Does it make us happier? Years ago, social psychologists Richard Hackman and Greg Oldham developed their now-famous job characteristics model. 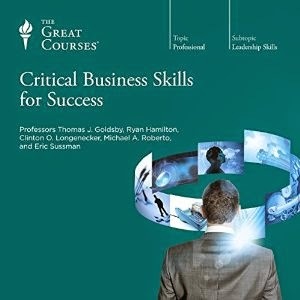 They argued that five key characteristics affected outcomes such as job satisfaction, intrinsic motivation, and quality of work produced. One of those job characteristics was skill variety. If a job required employees to employ a variety of skills and capabilities, that had a positive effect on these key outcomes. "It seems the pivot point is around a day," Etkin said. "We find that over longer periods of time — a day, a week or a month — spending time on more varied activities does lead people to feel happier afterwards. But over shorter time periods — an hour, 30 minutes or 15 minutes — people feel less happy after spending time on more varied things." "When people think about variety, they think it's exciting, stimulating and interesting. But we also derive a lot of happiness and satisfaction from feeling we accomplished something with our time. What we find is that shorter time periods really don't give people enough time to transition between varied activities and still feel productive." 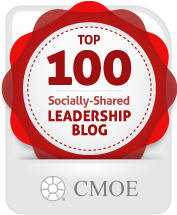 Should States Stop the Strict Enforcement of Non-Compete Agreements? States that enforce non-compete agreements and those that enforce them more strictly have fewer startups. Entrepreneurs usually have prior experience in the industry they enter, or in a closely related one; non-compete agreements can thus prevent them from striking out on their own. Even if they can found their own firms, these agreements hamper their ability to hire early employees. As a result, a dollar of venture capital goes further—in terms of creating more jobs and more economic growth—in states that restrict the enforcement of non-compete agreements. Some of our research indicates that venture capital creates two to three times as much economic growth in regions that do not enforce these agreements as it does in regions that do. States that enforce non-compete agreements also suffer from a brain drain, with sought-after employees leaving states like Massachusetts, which enforce non-competes strictly, for states like California, which do not. Many of the students we teach at MIT and Yale to move to California for this very reason. The enforcement of non-compete agreements therefore imposes an economic cost on all of us. We support these reforms not so much because they might help to right some of the wrongs associated with non-competes—though they should help to do that as well—but because they would promote economic growth. Whether you run out and grab something from a restaurant or bring leftovers from home, about 40 percent of us eat lunch at our desks. Most of us do this because we believe we'll get more done. And if you're like me and often work from home, it might seem utterly ridiculous to sit down at the table to eat when there is no one to talk to and the computer and phone are just a couple feet away. I believe I'll get through more items on my to-do list if I multi-task. But working through lunch only feels more productive. In fact, "...research shows that there are tremendous performance advantages to stepping away from your computer, and even more pluses if you can get outside. Taking a break from cognitively taxing work improves creative thinking," says Kimberly Elsbach, professor of management at the Graduate School of Management at the University of California at Davis, "and everybody's job has a creative component, such as problem-solving, managing teams or finding creative solutions." Not to mention taking a break from that steady stream of emails helps reduce stress and, in turn, helps keep you be healthier. Who Drives for Uber and Why? Jonathan Hall and Alan Krueger have published a new National Bureau of Economic Research working paper about Uber. They explore the backgrounds and motivations of Uber drivers. Many people have been critical of Uber, arguing that it is wrong for Uber not to treat their drivers as employees (they treat them as independent contractors). Others have been debating the impact of the so-called "gig economy" - does it help or hurt the average worker? For these and other reasons, the scholars found it interesting to explore survey data from 2014-2015 about Uber drivers. The findings are fascinating. Here are selected excerpts from the paper. You can read more here. Uber's driver-partners are highly educated. Nearly half of Uber's driver-partners (48 percent) have a college degree or higher, considerably greater than the corresponding percentage for taxi drivers and chauffeurs (18 percent), and above that for the workforce as a whole as well (41 percent). In addition, most driver-partners do not appear to turn to Uber out of desperation or because they face an absence of other opportunities in the job market—only eight percent were unemployed just before they started working on the Uber platform—but rather because the nature of the work, the flexibility, and the compensation appeals to them compared with other available options. Around 80 percent of driver-partners reported that they were working full- or part-time hours just before they started driving on the Uber platform. Only eight percent of driverpartners in 2014 (and 10 percent in 2015) said they were unemployed just prior to partnering with Uber. This low percentage is notable given that, for the economy overall, about 25 percent of new hires came from unemployment and 70 percent came from nonemployment in 2014 and 2015.13 The large share of drivers who partnered with Uber while they had another job suggests the role that Uber plays in supplementing individuals’ income from other sources. In 2015, 52 percent of driver-partners worked full-time on another job, 14 percent of driver-partners had a part-time job apart from partnering with Uber, and 33 percent of driver-partners had no other job. Nearly half of driver-partners view income earned on the Uber platform as a supplement to their income but not a significant source (48 percent). Is One-Stop Shopping a Good Thing? When many firms pursue diversification strategies, they argue that they can provide one-stop shopping for clients. This logic implies that one-stop shopping adds value for the customer, and that the multiple business units inside the corporation are more valuable together than apart. For many firms, cross-selling becomes a key initiative, to try to provide that one-stop shopping experience (Wells Fargo, anyone?). Does one-stop shopping make sense though? Do customers actually want to purchase a series of related services from one supplier? Would you like to have all your financial relationships with one firm, or would you prefer to purchase your insurance at one firm, secure a mortgage at another, and invest in bonds at yet another company? Olivier Chatain and Denisa Mindruta have written a paper on this topic. The paper is titled, “Estimating Value Creation From Revealed Preferences: Application to Value-based Strategies." The authors presumed initially that one-stop shopping created value for clients. 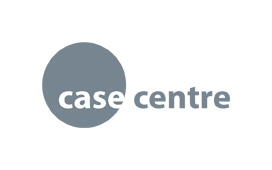 After all, the firm provided customers more convenience, and it could apply learning from one aspect of a customer relationship to the provision of other products and services. Synergies seemed readily available. The research, however, demonstrated that significant drawbacks may exist to a one-stop shopping strategy. I'm not shocked; I've always been skeptical of such strategies. I think firms overvalue synergies routinely. Moreover, I'm not sure customers actually want to put all their eggs in one basket. They also get annoyed at times when firms are constantly engaging in cross-selling tactics. What we think is that — especially for the law firms we were looking into — … even though you may know a client well, each time [you provide a new service to him], it’s almost like [starting] a different subject. You really have to start over and learn a lot about the client. An alternative explanation [for our results] is that some clients are very worried about having one supplier of service serving multiple areas. So even though you might be the best expert for me, if you’re already my best expert for two or three other subjects in law, I may want to deal with someone else because I might be afraid if I get all the information from the same supplier, I might be missing out on some important themes. I might have a preference of diversity in terms of input, which was something that is apparently more important than the savings you can realize by bundling all these products together. Many firms struggle at times with an aging customer base. We have seen firms such as Harley Davidson and Talbot's face this challenge in recent years. Neiman Marcus provides another example of a firm that has had difficulty attracting younger shoppers. According to Fortune, the average age of a Neiman Marcus shopper is 51 years old. What is Neiman Marcus doing to attract younger shoppers? They have come up with an interesting and creative strategy. They are partnering with Rent the Runway, a firm whose focus is millennials. Their average age is 29 years old. Rent the Runway will open small boutiques in select Neiman Marcus stores. Rent the Renway appears to seek access to shoppers who want the touch and feel available in a physical location - something that their online business model does not provide. Mutually beneficial partnerships, such as this one, might be an effective strategy for firms who face an aging customer demographic. What's the risk? Certainly, one worry is cannibalization. Will they take sales away from one another? A more interesting question, though, is whether those young consumers, the millennials, will convert to purchasers at Neiman Marcus. Can these folks afford the premium-priced goods at Neiman Marcus? A key strategic risk emerges if Neiman Marcus begins to offer lower-priced goods to cater to these young shoppers. That move might compromise their premium, differentiated competitive positioning and their reputation for high quality. Moreover, what if they cause a decline in satisfaction among their core customers by carrying more of the types of clothes that attract millennial shoppers? Older women may not like the fashions that millennials seek. Getting younger is a challenging proposition for any firm; it's not as simple as it may seem. 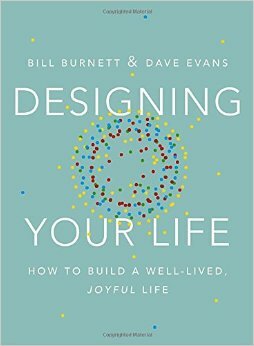 Dave Evans and Bill Burnett have written a terrific new book titled, Designing Your Life: How to Build a Well-Lived, Joyful Life. Evans and Burnett discuss how people are often encouraged to find their passion and pursue that vocation in their life. They point out that it can be very difficult to discover one's passion simply by sitting in a dorm room or apartment dreaming up potential visions of the future. Introspection and reflection alone do not allow for this discovery to occur. What's the alternative mechanism for discovering what you want to do in your life? They argue that individuals should apply the principles of design thinking. They should prototype and experiment early and often. They should try a variety of things, expose themselves to different domains, pursuits, and professions. Then they should reflect on these experiences and consider what makes them happy, what motivates and inspires them, and what they consider rewarding. Moreover, individuals should consider the circumstances in which they feel intellectually challenged and highly engaged. How does one experiment and prototype? They take internships in different industries or companies, shadow someone in a particular profession, work on course projects in different domains, network with people in various roles, volunteer in various organizations, etc. In short, they design different ways to test whether they, in fact, are passionate about a particular job, role, industry, etc. For well over a decade, researchers in consumer behavior have debated whether the ever-expanding array of goods creates “choice overload” that can actually discourage people from buying. 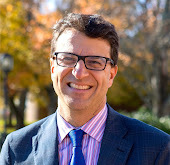 Barry Schwartz, a psychologist, wrote a famous 2004 book on what he called the “paradox of choice.” But many other scholars — not to mention marketing executives — have been doubtful. Customers may groan at the bewildering choices they face when ordering something as simple as coffee, but they still seem to want them. And companies keep offering them. In fact, a 2010 survey of more than 50 separate experiments on choice overload found that the results of bigger selections were essentially a wash. Big assortments discouraged consumers in some studies but encouraged them in others. On average across the studies, the impact of a big selection was about zero. What has Simonson found in his research? He conducted a series of experiments, and he has found that the way choices are presented matters. In the experiments, he examined the situation in which a person begins by considering whether to make a purchase at all, and then tries to determine which particular item to buy. In contrast, he looked at the situation in which someone tries to select among a broad assortment and then determines whether to buy. Simonson found that "choice overload" does not exist if someone begins by thinking about whether to buy at all. In that case, having lots of choices appears to be a very good thing, and people are more likely to buy if presented with many choices. Andrews writes, "If, however, a person begins by picking a favorite from an assortment of options, and only then deciding whether to buy, a large selection makes the task harder and lowers the likelihood of buying." "Harris believes strongly in taking inspiration trips. She was just in Chile, learning about local artisans. She's created entire collections after particularly inspiring trips to India and France. To this end, Stella & Dot invests heavily in sending Harris and other designers to foreign countries. But you don't have to spend a lot of money to see things you wouldn't ordinarily see. An important part of this process is learning new things. So Harris also encourages her team to take classes in new fields. For instance, architecture has been particularly helpful to members of the design team. "If you don't have the budget to travel, you can disrupt your routine by going to work a different way, go to a new restaurant, or find ways to meet new people," Harris says. "When you disrupt your thinking like that, it actually slows down time, and you start to be able to take in all your creative inputs differently." I concur wholeheartedly with Harris' recommendation. In fact, neuroscience supports this suggestion. Research shows that "pure novelty spurs the brain." Specifically, the substantia nigra/ventral tegmental area of the brain has a substantial impact on learning. According to Science Daily, "Researchers Nico Bunzeck and Emrah Düzel report studies with humans showing that the substantia nigra/ventral tegmental area of the brain does respond to novelty as such, and this novelty motivates the brain to explore, seeking a reward." The Wall Street Journal reported this morning on Disney's quarterly earnings announcement, noting that the news disappointed investors. "Declining income at ESPN continued to overshadow quarterly results at Walt Disney Co., with the sports powerhouse posting lower advertising and subscription revenue that dragged company earnings below Wall Street expectations." These results continue a multi-year slide in subscriber numbers at ESPN, as many American consumers "cut the cord" - ending their cable television subscriptions. Some people estimate that ESPN has lost more than 10 million subscribers in the past several years. This news raises a key question for me: Should Disney sell ESPN? That question may shock some people, as ESPN has been a substantial contributor to Disney's total net income since it was acquired as part of the Disney acquisition of Capital Cities/ABC two decades ago. 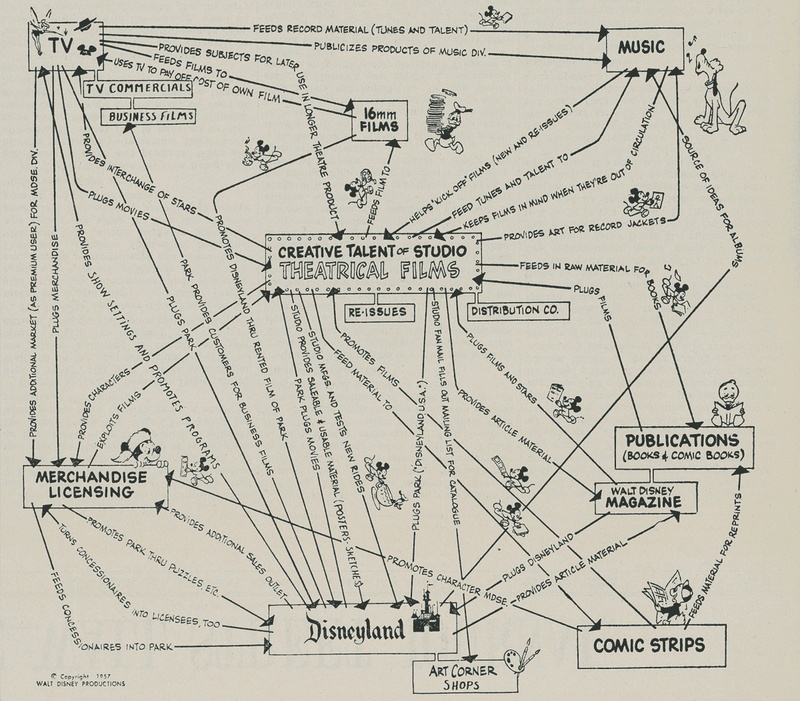 However, Disney's corporate strategy has evolved considerably since that time. During the second half of Michael Eisner's tenure as CEO, Disney diversified well beyond the businesses that leveraged the animation studio as a central asset (acquiring ABC, owning baseball and hockey teams, etc). However, during Bob Iger's tenure, characters have become the driving force of the corporate strategy once again. The three major acquisitions during Iger's tenure have focused on expanding the character portfolio, so that Disney can leverage those characters across multiple platforms (i.e. Pixar, Marvel, and Lucas Films). In many ways, Iger has returned Disney to its roots. 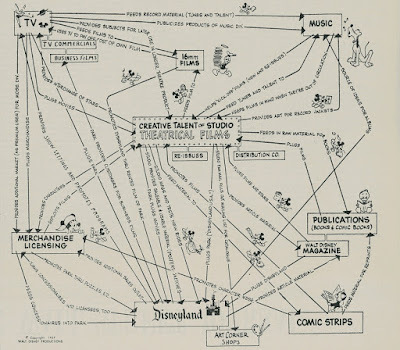 Below you will see famous chart created by Walt Disney himself to describe synergies at the company. One has to ask: How does ESPN fit into this chart? Absent major synergies, and facing a long term disruption to ESPN's business model, might Disney be better off divesting the business unit? Alternatively, Disney has to take a hard look at reinventing the business model at ESPN, rather than tweaking the strategy. A reinvention seems necessary given the long term trends regarding cord cutters. What Will Our Rivals Do? Instead of thinking up what you should do, think about how your rivals are working to counteract what you're already doing? How would you drive yourself out of the market? Research suggests that we're able to think of more creative solutions when our frame of reference is someone else, rather than ourselves. In addition, if you think of what you're competitors would do to steal your customers, you can think of ways to turn that around and gain more customers yourself. I recommend taking it one step further. 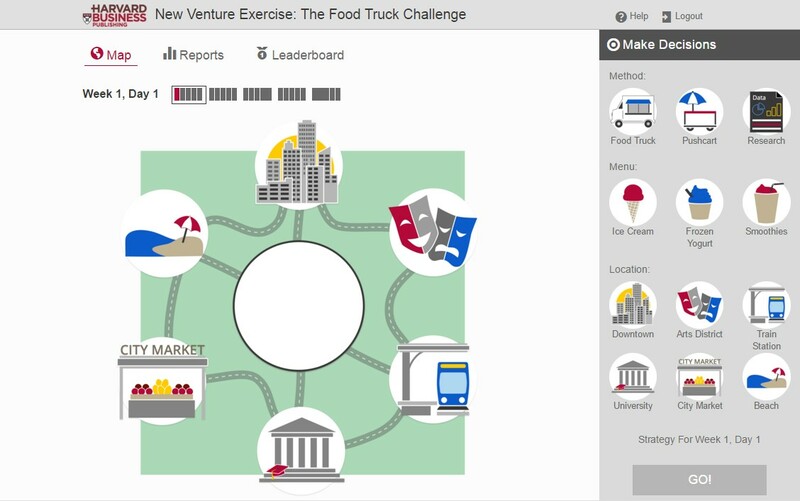 Ask some members of your team to role play the competition. Have them devise strategies to destroy your business, or responses to your next proposed strategic move. That type of role play can open some eyes and help you reframe a situation to spark creative thinking. 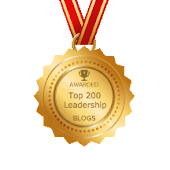 In follow-up laboratory studies, we found that people engage in such behaviors because disconfirming feedback threatens their own views of their skills and accomplishments. The lip balm category struck them as a prime candidate for innovation, since the vast majority of products on the market "were indistinguishable" from their 100-year-old predecessor, Teller says. Many brands appeared to be driven primarily by cutting costs and competing on price, he points out. "It appeared to us that everybody in this category was being lazy. That was an opportunity." EOS chose their target market carefully. They focused on millennial women, rather than trying to be all things to all people (generally, the existing products approached all customers uniformly). Specifically, they targeted "millennial women between the ages of 25 and 35 who were style conscious." Why? Their research showed that these women tended to be heavy users of lip balm, yet they did not find the application of lip balm to be enjoyable at all. Co-founder Sanjiv Mehra notes, "The products that women depend on every day should deliver moments of delight that elevate these daily routines." They made a series of other choices that fit with this target market. They tried to "engage all five senses, from soft round packaging that felt good in the hands to the colors of the orbs, to the smells, to the way the flavors tasted, and even to the clicking sound the sphere makes when it closes." Segran writes that the founders tried to build an emotional connection with the customer. They weren't just selling a utilitarian product. They wanted their product to be fun, even delightful. What a terrific story! The EOS entry into this "tired" market offers several important lessons. First, if many existing incumbents are trying to be all things to all people, then a strategy with a laser focus on a specific target market might be quite successful. Second, empathy with the users can deliver innovative design concepts. Understanding these millennial women delivered key insights that led to an innovative product tailored to their needs. Third, customer needs go beyond the obvious service that is provided. Yes, people don't want chapped lips. However, these millennial women cared about more than the quality of the balm itself. EOS' focus on the five senses demonstrates one can delight the customer by paying careful attention to many details about the customer experience. Ultimately, EOS is selling more than lip balm, just as Starbucks is selling more than coffee.